After you resolve this event, end your action phase. Make a run on a remote server. If successful, remove the first non-agenda card that you access from the game. Until the game ends, whenever you access a copy of tha card, remove it from the game. The first is exemplified versus Jinteki Biotech: Life Imagined that's running Cerebral Overwriters, Mushin No Shin, and 5/3 agendas. If they Mushin out a card and advance it, you're usually stuck with gambling on whether it's a trap or an agenda. Watch the World Burn eliminates that threat, letting you run it without fear. But not only does it remove the trap you access from the game, it also makes you immune to that trap for the rest of the game. Even if the card you remove has a trash cost of 5, you still only save 2 credits, which is a bad return on investment. So unless the remove-from-game ability or the all-copy removal are relevant, as it is in the above scenarios, it's not worth using. 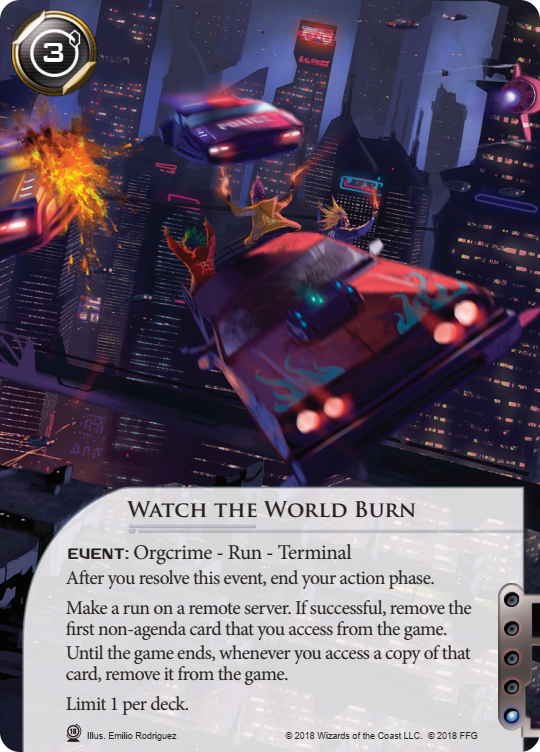 Watch The World Burn is the runner variant of the two community created cards for the Magnum Opus event. For the cost of 3 credits and a run on a remote, you get to remove an upgrade or asset from the game, as well as any other copies of that card you access later on. This is a card where even at first glance, one can see why it is powerful. Not only do you get to get rid of an asset/upgrade for good and nullify the corp's recursion, you don't have to pay its trash cost. And on top of that, it also dodges nasty trash effects, which means that Controlling the Message's trace or AR-Enhanced Security will never fire. Industrial Genomics and Gagarin also hate this event. Ultimately the power of WTWB lies in its versatility. It is great against pretty much every corp, unless they play no assets or upgrades, which is highly unlikely. Removing an Ash or Rashida Jaheem in the glacier match up is highly relevant. Get rid of Prisec against Argus. Arella Salvatore against Sportsmetal. The possibilities are endless. One of few downsides is its limited-to-1 status, meaning your are likely to not have it in hand when you need it. Just like Rebirth though, this card can be incredibly swingy once drawn. Also, it costs 1 influence for every runner and it ends the action phase. Still,I expect this card to become a staple in most runner decks, especially if CTM remains the deck to beat for the time to come. I played this once against Blue sun, breaking several missingos with grappling hook + Kongomata, expecting to burn a illegal arms factory and slammed head first into a standoff, which I instead stole. 10/10 would burn the world again.